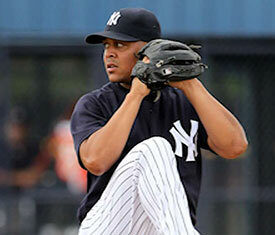 Top New York Yankees pitching prospect Justus Sheffield was placed on the 7-day minor league disabled list on Saturday after leaving his Friday start early with shoulder tightness. Sheffield, 21, completed 3 2/3 innings in his most recent outing for the Triple-A Scranton/Wilkes-Barre RailRiders, and is expected to miss just one start during his DL stint. In seven starts between Double- and Triple-A, Sheffield has gone 1-3 with a 2.23 ERA this season, striking out 48 batters in 36 1/3 innings. RailRiders manager Bobby Mitchell expressed optimism in Sheffield's ability to make a quick comeback, and Sheffield himself reported minimal pain in the shoulder a day after exiting the game early. Stay tuned for the latest news and developments on Sheffield's injury as he continues to work his way up through the New York Yankees farm system. Justus Sheffield still doesn't seem to worried about the injury. In fact, he said the shoulder feels fine today. Since the RailRiders have a day off Monday, the DL stint he's essentially just being pushed back a couple days.